I have a confession to make. You may want to sit down for this. What’s that? You’re already sitting down? Well, could you, maybe, get up and sit down again? Just for effect? Great, thanks! So, here goes: I can’t roller skate. I’ve never learned how to do it and never really had many occasions or reasons to. I mean, it’s not like it’s an absolutely necessary skill to learn. There are no cities where all commuting occurs exclusively via roller skates. Being an expert roller-skater doesn’t tip the scales significantly in your favour during job interviews. Well, unless the job includes a heavy amount of roller skating, like being a police officer, apparently. Having said that, I’d like to learn, if only to stop being the laughing stock whenever the subject of roller skating comes up. We meet yet again, my mortal enemy! Which brings us to yesterday. It was the first proper spring day in Denmark after a long period of hail, cold, wind, rain and other phenomena that generally don’t belong in spring. So my girlfriend took me out and put me on a pair of inline skates that she’d borrowed from a friend. No, I didn’t instantly fall over like Bambi on ice, if that’s what you were expecting. Why would you want to laugh at my pain? Are you some kind of sadist? However, it did take me a while to acquire a very basic understanding of how to propel myself forward on these wheeled contraptions. I’ll tell you this much – roller skating and walking are two very different means of locomotion. Over the course of a half hour I’ve progressed from “walking on skates” to “sliding awkwardly on skates”. So it would appear there’s still hope for me. I may just learn this roller skating business after all. I’ll make sure to keep you posted, because I know how much my learning progress means to you! Bonus info: other common activities I haven’t properly learned include skiing, ice-skating and shutting up about activities I’m not good at. How about you? Any stuff you’ve never learned to do? Anything you’re not very good at that you’d like to improve? You did really well on that sitting down task, by the way! 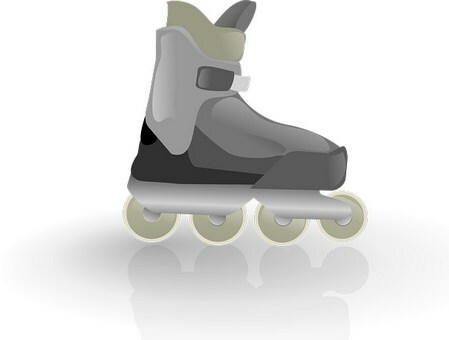 @BakedAlaskaInOr My quest for learning continues this summer when we buy a properly-fitting pair of roller-skates for me in Czech Republic! Thanks for your admiration, it has not gone unnoticed. ;)As for snow-boarding – that has always sounded fun to me, so it’s definitely on the list….but one thing at a time! @FoodStoriesBlog Thanks for the nomination, hope you’re having a great weekend yourself! I can stay upright on roller skates and ice skates. I can even propel myself forward. But I cannot turn the corners to save my life. Is really not pretty. Here’s hoping you stay bruise-free. @crubin Hehee thanks, I think you and I are now at a pretty similar stage…let’s see how things develop! I never learned brain surgery, rocket science, fracking, chimney maintenance, auto mechanics, glass blowing, golfing, jazz ballet, sky diving, bungee jumping, camel riding, para sailing, gold panning, hunting, taxodermy, advanced mathematics, fencing, what pi means in the grand sceme of things – yikes, can I just say what I have learned??? Good for you for trying! In 4th Grade I was rejected for the Glee Club. In 5th I tried the clarinet. In 6th, the saxophone. In 7th I got a cassette player and got pretty good at recording music from the radio, though. And in 8th I did an admirable job of listening to that music. In 9th they humored me and let me into the high school choir as a bass, where I stood behind the sopranos and sang falsetto instead to hide the fact that I couldn’t make it as a bass singer. In 9th I tried the guitar, where I only learned two chords (the two necessary to play America’s “A Horse With No Name”). In 10th I bought a small church organ, with three tiers of keys. I learned one song: the Skaters’ Waltz. But my greatest success was impressing my friends with the biggest instrument of any of them. Size does matter. The old cliche of picking yourself back up and trying again comes to mind. There are too many things I am bad at to mention! The older I get the more I focus on what I can do, even if it is a very short list! Not that you should never try anything new. So,good luck with the roller skating! @Daniel Nest The only regret is it is hard to type with the darn things!